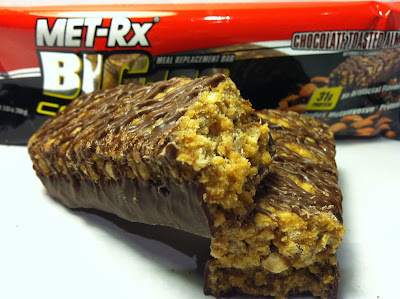 I've yet to figure out why I continue to buy these MET-Rx bars since I don't use them to build muscle or as meal replacement bars as they are intended, yet I continue to do reviews on them. My willingness to keep forking over cash on something I don't really want or need leads me to do yet another review with this MET-Rx Big 100 Colossal Chocolate Toasted Almond Bar from their Big 100 Colossal line of bars. Dubbed as a Meal Replacement bar, this hulking bar clocks in at 3.52 ounces and consists of 410 calories and 31 grams of protein. One note is that the bar advertises on the front of the packaging that it includes Metamyosn Protein, which admittedly sounds kind of scary because I have no idea what it is. Still, it can't be all bad, right? Oh yeah, this was picked up on sale at CVS for $2.00. 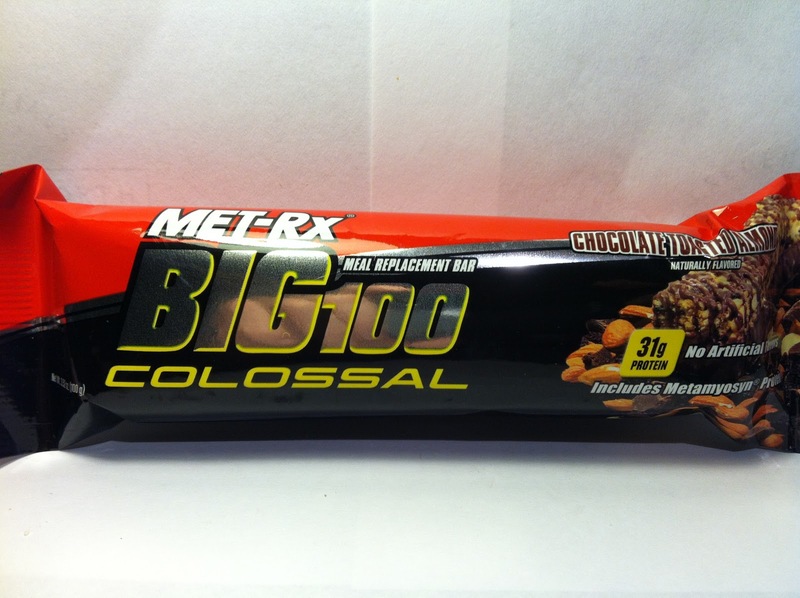 I knew this bar would be huge before I took it out of the wrapper, but despite that knowledge, it never fails to impress me how large and dense these MET-Rx bars are. This one was constructed of a thick chocolate base topped by the standard rice crisp mix of all these bars. Within the rice crisp mix was a spreading of the toasted almonds which were broken up and of medium size. Also in the mix, was an unexpected amount of currants and I was not expecting that at all since the name and picture on the packaging made no reference of them being present in the bar. The bar was then topped with a fancy chocolate drizzle and that wrapped up the entire package to make this one look pretty and more appetizing to eat. Biting into the bar, it was at first difficult to chew, but after a couple of chews, the rice crisp mix softened up and it was definitely quite edible. Within the crisp chew, the almond pieces added a nice occasional bite of crunch, although no flavor, as I made my way through the bar. The one thing that did notice was the presence and strong taste of the currants. They added a "soft" chew to the bar and also brought an very strong taste of tang and sweetness that I was not expecting at all based on the name of the bar. That sweetness was not a bad thing because the sweetness of the currants mixed well with the hearty and semi-sweet taste of the chocolate along with the crunch of the rice crisp and almonds. Had the currants not been present, this would have been a moderately boring bar. The currants took this one up another level. Buy It or Fly By It? I would say BUY IT to this one. The currants took this bar to another level and that was a good one. Actually, their presence and taste is what made this bar a winner in my book because if they were not there, I would have deemed this bar too boring to recommend to anyone. With the presence of the currants, I would have no problems recommending this bar to my favorite meathead or to someone looking to replace a meal.